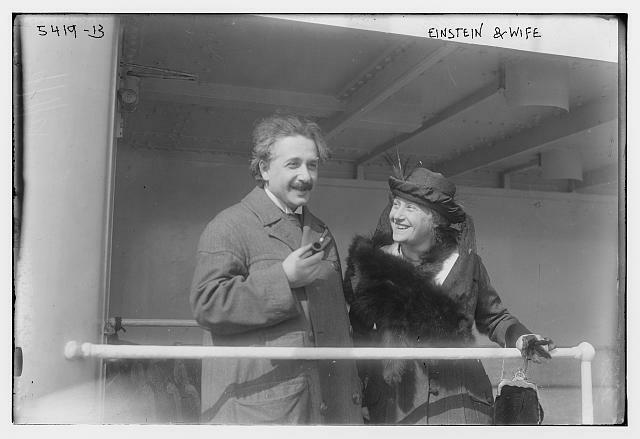 Einstein didn’t have to poop on the potty! Buster is adept at many skills for a two-year-old. He holds a pencil like a pro and draws abstract art as if preparing for his gallery opening. He makes up his own songs to serenade his Mommy at bedtime. He knows his way around an iPad better than I do and makes that little guy leap over the stampeding bulls in his favorite game with dexterity to make my head spin. Teaching Daddy how to manage those tricky snaps on the baby’s Onesie. Yet there are some toddler skills that Buster is not ahead of the curve on. It would be one thing if he didn’t have the capacity to do certain things, but he does. It’s more of a defiance issue, although even that doesn’t truly capture the spirit of it. It’s defiance mixed with indifference. Buster thinks he’s pretty smart. I don’t know if he styles himself a genius, but his affinity for playing jokes can only lead to the conclusion that he believes he’s pretty clever. And a clever boy shouldn’t be asked to learn things he sees little use for in the rest of his life. Just as an older child might ask about the long-term utility of Algebra, I hear, in Buster’s spirited remonstrations, the philosophical query: “When will I ever use big boy underpants in real life?” Such garments hold no candle to the convenience of the diaper. “Einstein didn’t have to poop on the potty!” He doesn’t know anything about Einstein, and he doesn’t say this literally, but I can see in his eyes the formation of an idealized, toddler image of genius. His aggravated eyes tell me that the child genius would never waste his time on something so trivial. “Galileo didn’t pronounce K, F, or S sounds!” I bet he did, though this is not really about Galileo. It’s about a toddler whose opinion of his own world view dismisses the need to do inconvenient things. 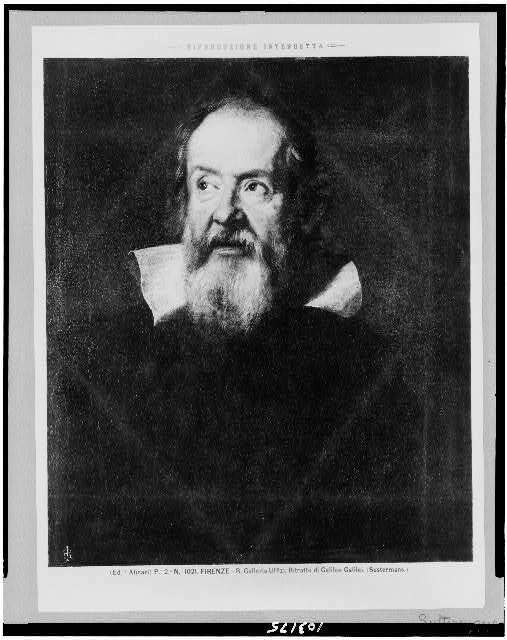 Galileo Galilei: also too clever for his own good. The inquisition was not amused by his jokes. It’s easy to replace the unnecessary consonants in words with the ever useful D and T. Mommy and Daddy understand the words formed by these substitutions, and since they are the only people he will ever need ask for a bowl of Lipton Noodle Doup, there’s no point in wasting effort on the unnecessary. Buster can make the S sound. I know, because I’ve hounded him into doing it. He just doesn’t see the need. It is, after all, marginally more difficult for his tongue than making the D sound, so why bother? Because Daddy is a trouble maker. One day, daddy wouldn’t make him any doup until he made the S sound. “If you want soup, say ssssssss,” Daddy demanded. Buster held out as long as he could, but he really wanted that soup. Finally, he relented. “Sssssss,” he said. “Now, say sssssoup,” the heartless Daddy persisted. That was close enough. Buster got his soup. And the last laugh. 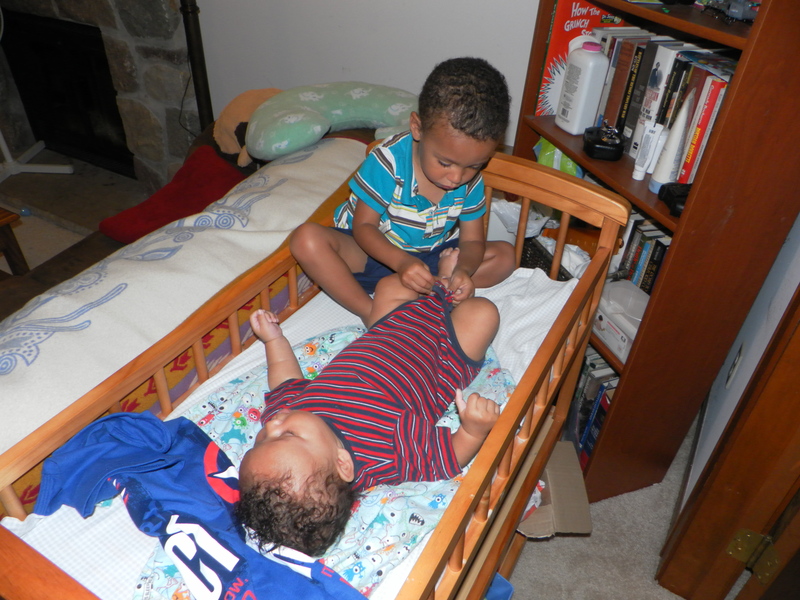 This entry was posted in Toddler Trouble and tagged boys, children, Dads, Education, fatherhood, humor, language skills, parenting, potty training, toddlers. If you free up brain space that you would otherwise dedicate to making the S sound or learning to use the facilities, you can use that brain space for pondering matters such as physics. Voila. Einstein! I hope he enjoys his doup. Yes, I’m sure he spends all of his extra time pondering physics. He’s scientific like that. Don’t be so dupid dad, bring Einstein his Doup. Poor Snoozer. Buster is going to keep you changing his diapers until junior high. By that time he’ll be changing mine. There’s probably an app for that…not the diaper changing thing, but for pronouncing Ssssssss. Buster seems to be a strong willed one, it won’t be long before he is telling you, “These are not the droids you are looking for.” Watch out. But will I understand him? He’s got to start working in some of those other consonants before he starts telling me important things like that. I remember Princess battling with the S as well, but it was Dude’s relentless refusal to use the L and R sounds that made for the funniest pronunciations. Especially considering they are crucial in Afrikaans. Fortunately, everything in English can be communicated with only vowels, D and T.
J spent his two’s pointing out dump trucks. Only he left off the p in dump and pronounced the tr as an f. It was generally better when there wasn’t a person in between his pointing finger and the aforementioned truck. Go ahead. Keep believing there was a dump truck there. That one is snortworthy, which, in case you are not aware, is a very high compliment. K also sees no need to poop on the potty. She’s got a little one in her room– the one she learned on, and I’m convinced that I will carry her excrement down the hall to the bathroom, and flush it down the toilet for her forever and ever. Thank you for the snort. That’s sweet that you and your little girl have a thing you do together. You can never replace that kind of togetherness. I think the only value in those portable potties is that they force you to find a better place for your kid to poop. Is a hashtag good, or does that mean I’m an honorary Kardashian or something? I think you’re right about those little potties. What’s worse, even, than trudging your child’s excrement down the hallway to dump in the real toilet, is the problems you face while out and about. Your child expects the little potty to be available at every Target, Grocery, and relative’s house for her use at any given time, so you have to tote your child’s potty along with you wherever you go, and then go out to the car and get it anytime nature calls your child. And you better be quick about it. Do you want to be an honorary Kardashian? It’s pretty far down my list. That header picture is just too hilarious! Thank you. You can’t fall asleep on these kids. Buster is probably holding out for rewards for using those exotic sounds like “s.” Clever boy. He is absolutely holding out for rewards. What self-respecting child could do anything less?